Hearing of violence against Jewish community in Germany and Austria, English stockbroker Nicholas Winton organised transport of children to safety. 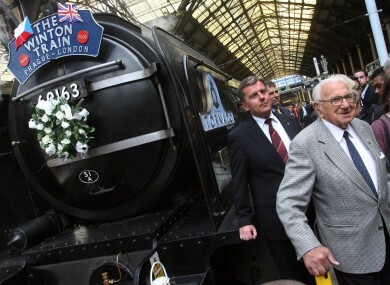 Nicholas Winton, seen here at age 100 in 2009, beside the 'Winton Train' at Liverpool Street Station in London. ON 3 DECEMBER 1938, an English stockbroker made the impromptu decision to cancel his skiing vacation and join a friend in Prague, who had desperately asked for his help. The decision changed his life and saved the lives of 669 people in the process. Nicholas Winton, now 104 years old, joined his friend Martin Blake in Czechoslovakia to help refugees created by the German annexation of the Sudentenland. Winton was of German Jewish ancestry and had heard of the violence against Jewish communities in Germany and Austria, especially the infamous Kristellnacht. After hearing about the Kinderstransport, an effort of British Jewish agencies to bring 10,000 Jewish children to Great Britain, Winton knew he had to arrange a similar operation in Czechoslovakia. I found out that the children of refugees and other groups of people who were enemies of Hitler weren’t being looked after. I decided to try to get permits to Britain for them. I found out that the conditions which were laid down for bringing in a child were chiefly that you had a family that was willing and able to look after the child, and £50, which was quite a large sum of money in those days, that was to be deposited at the Home Office. The situation was heartbreaking. Many of the refugees hadn’t the price of a meal. Some of the mothers tried desperately to get money to buy food for themselves and their children. The parents desperately wanted at least to get their children to safety when they couldn’t manage to get visas for the whole family. I began to realise what suffering there is when armies start to march. Winton set up his rescue operation at his hotel in Prague, taking applications from parents and registering the children. The response was huge, with thousands of parents lining up. Surprisingly, Winton recieved little resistance from the Nazis on his effort to move the children out of the country. After a few weeks, Winton left Trevor Chadwick in charge of the Prague operation and returned to London to negotiate where the children would go. Only Great Britain and Sweden agreed to take the children. To get foster families willing to pay the £50 fee for each child, Winton advertised in newspapers, churches, and synagogues with pictures of the children. The effort worked. This man is holding up the papers secured for him by Nicholas Winton that allowed him to escape the Nazi reign of terror as a child. Image: Jeff Moore/Empics Entertainment/PA Images. The last train of children left Prague on August 22, 1939. By the time it was all said and done, he had saved 669 children. His greatest regret is that he could not save more. There was to be another train of children on 1 September 1939, but Hitler’s Germany invaded Poland that day. All borders were closed. The children were never heard from again. Winton never told anyone of his mission, not even his wife, Grete. Fifty years later, in 1988, his wife found a scrapbook with photos, documents, and the list of children. She brought it to a Holocaust historian, who arranged for Winton’s story to appear on BBC’s That’s Life. Unbeknownst to him, the audience at the taping was filled with his “children”. Email “75 years ago this week, this man saved 669 children from Nazi death camps”. Feedback on “75 years ago this week, this man saved 669 children from Nazi death camps”.